Last year I found the cutest free pattern for a little crochet clutch bag. I absolutely have been using this baby all the time now. I am not usually a big purse carrier anyway, as most of the time I just slip a thin wallet in my back pocket and call it good. I actually marvel at those ladies with those heavy 20 lb totes slung over their shoulder and wonder what the heck they have in there at any given time. This purse is perfect for going to the store, running errands, or a night out on the town, and just big enough to hold all the essentials: A small wallet, your cell phone, some hand sanitizer and your keys. I'm also told it's the perfect size to hold a Nintendo DS or other small electronic equipment, so it would also make a great gift for the tween or teen in your life too! Not to mention it is down right adorable. I have people all the time stop me and say... did you make that?!! One lady even stopped me in a craft store and I had to give her a link to my pattern to my blog before she left! Well this week I decided it was time to make myself another one, and this time to use some of my favorite colors! I love to hook this baby over my wrist while I'm pushing the cart around the grocery store. It keeps my valuables next to me and not left in the cart when I turn my back to get something off the shelves. Here is a picture of what the first purse I attempted looks like, and here is a link to my blog about how I made the pattern easier than the original free pattern by starting with the bottom of the bag closed instead of creating it open then whip stitching it together at the end. Sara at Tangled Happy has three lovely versions of this same clutch purse. 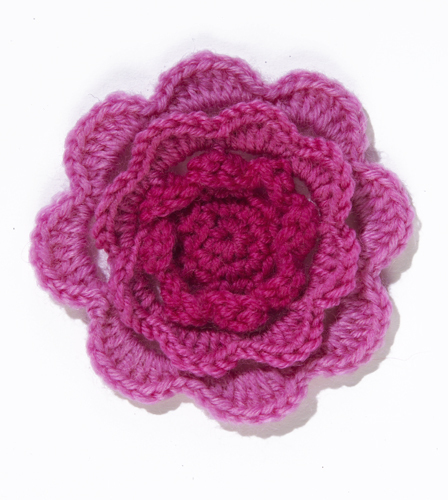 The first time I made this, I used soft bulky 5 weight yarn with a purple flower accent. This time I used a Lion Brand Homespun yarn in black, for a more textured look. You can see it's the exact same pattern, however, the puffiness of the yarn almost makes it look like there are no holes. Once I had the flower created I chose a small pearl to give some shimmer to the middle of the flower. Next I blind stitched it carefully to the bag so that neither stitches shown on the top, nor on the inside of the bag. The trick is to make small stitches in the middle of the yarn threads so they don't show up on either side. After that throw in your essentials, runs some errands, then sit back and wait for the complements to pour in. By the way, this pattern whips up fairly quickly. I made the bag one evening while watching just a few TV shows, then I made and attached the flower the next evening. Intermediate to advanced crocheters could make this entire bag in a few hours. Enjoy! LOVE these!! But you have to tell me the trick to working with that homespun yarn. I just cannot do it. It's actually the reason I gave up on crocheting several years ago - I couldn't find the stitches in all of that fluff. I can knit with it ok, but no dice on the crocheting, even though I'm pretty confident in my crochet skills now. Tips? ?